Who: Design Museum Communications team. 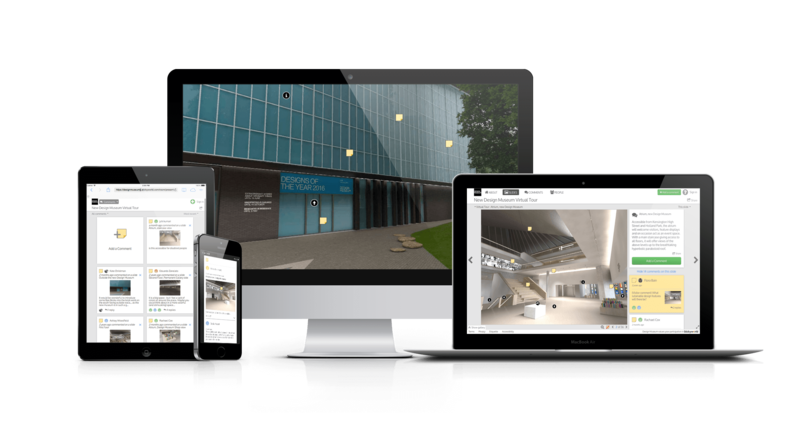 What: Online visitor engagement in future building layout using 360 virtual tours. 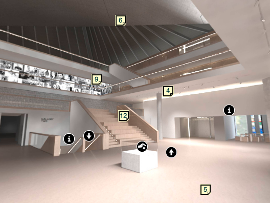 Why: Design Museum staff were looking to engage online visitors and drive early interest in the new building, gather feedback suggestions for exhibits and answer any questions. In 2016 Design Museum will leave their current home in Shad Thames next to Tower Bridge and move over to High Street Kensington, to a newly refurbished Commonwealth Institute building. This building is being remodelled for the museum’s current and future needs by John Pawson Architects. The museum was looking for a way to keep up engagement and try a new way to interact with patrons during refurbishments. As part of an ICTomorrow challenge Stickyworld was used to build a virtual tour, presenting an immersive experience of the future museum, which takes the visitor up through the museum, and augmented with interactive sticky hotspots linking to information placed by museum staff. In addition, this example includes the ability to pledge donations to a JustGiving fundraising account. A range of computer generated images was prepared by the museum’s creative team for inclusion in the tour, including work by Alex Morris Visualisation, Miller Hare and an introductory video by Big Foot productions. The Museum’s in-house team were able to put the content together themselves using the tools available in Stickyworld. In this way Stickyworld has provided the museum with some early feedback about the design and it now plans future updated tours later this year.